So, it’s with happiness that I share art from two new McCarty picture books this morning, one out in a couple of days and the other coming out in May. 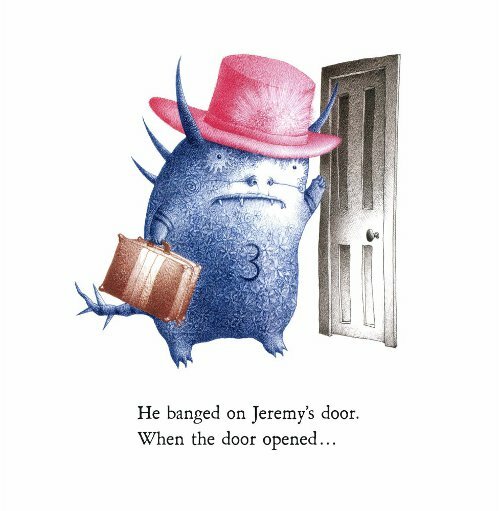 I don’t want to give it all away, but Jeremy devises a smart solution to his problem, the problem being that he expects the monster will very well occupy all his time, showing up to make demands, as he did last time. The monster he had created with his own pen nearly drove him up the wall, and his quick thinking this time, which I won’t give away, is clever fun. And involves more creativity and art, not to mention a little help from his friends. And, just as with the last book, the endpages alone make this worth your time. It’s just full to bursting with good art, I tell you. On display in Chloe are McCarty’s cream-colored pages, uncluttered backgrounds, finely-drawn creatures (I feel like I could count the furs on their heads), and soft pastels. (At the close of the book, he draws some trees that, alone, are fun to pore over — that is, if you really dig finely-drawn art, as I do.) Overall, he brings us, once again, the “atmosphere of warmth” that the New York Times noted in Henry in Love. For all I know, he’s got more titles coming out in 2012. Who knows. Let’s hope! THE MONSTER RETURNS. Copyright © 2012 by Peter McCarty. Reproduced by permission of the publisher, Henry Holt, New York. CHLOE. Copyright © 2012 by Peter McCarty. Reproduced by permission of the publisher, Balzer + Bray, an imprint of HarperCollins, New York. Photo of Jack is copyright © 2011 Jack Gantos and re-printed from this 2011 interview. Well, it’s hard to get any kickier than the psychedelic and very funny cover of The Monster Returns, but I do have more …. JAAAAACCCCKKKKK! 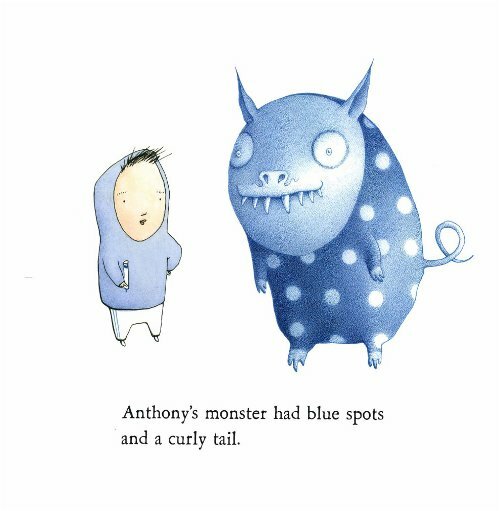 (Gantos, pictured below, got the Newbery!) Yes, I changed into my “Jack for Ambassador” shirt later that morning. I was also happy with the Caldecott winner and Honor awards. So many folks who got recognition on Monday have visited this year, and I was happy to hear their names called, seeing as how those folks who visited were a) talented and b) ever-so friendly, each and every one of them. Off the top of my head, I’m thinking John Rocco (Caldecott Honor), who visited in May; Rafael López (Pura Belpré Illustrator Honor), who visited in November; Lane Smith (Caldecott Honor), who shared early sketches from Grandpa Green in September; Melissa Sweet (Robert F. Sibert Informational Book Award), who shared early sketches from Balloons Over Broadway on Thanksgiving Day; and Jon Klassen (Theodor Seuss Geisel Honor), who visited in August. 2) Sendak being interviewed by Stephen Colbert (parts one and two, embedded below). Many people have emailed me to ask if I’ve seen it, simply due to my fan-dom. (I didn’t bother posting about it on Facebook, ’cause everyone was already.) Yes, I had heard the night before that he’d be on Colbert’s show, and I woke up the very next morning (since I don’t have cable channels) and cancelled my plans—no, really—just to watch it online AS SOON AS MY EYES WERE OPEN. ‘Cause, you see, I adore Maurice Sendak. I really do. I have spent years reading about him and his thoughts on children’s books. But mostly it was just a hoot, and it’s great to see Sendak laughing and having fun. Also, my favorite moment? It’s hard to top the bag of penises (penii? ), but my favorite part is The Girl with the Dragon Tattoo moment in part two of the interview, how—even though Colbert’s way of going about it is ridiculous (OF COURSE we’re not going to read stories of sadomasochism to our children)—he manages to tell THE Maurice Sendak that he has double standards. And THE Maurice Sendak, who totally got Colbert’s fake persona, just smiles and nods and says, you got me. In large part, these perceptions are what our upcoming Candlewick book is about (me, Betsy, Peter, that is), so it’s been fun to watch all of this play out this week. 5) This 15-minute short film, The Fantastic Flying Books of Mr. Morris Lessmore, is good stuff. 7) By the Hammer of Thor, this made me laugh. Pure, unadulterated goof-ballery. I love Liz Lemon. I’m glad you had such a fun week, Jules! I will come and watch your video selection tomorrow, they look like fun. I have just started watching 30 Rock on DVD recently (I often trail behind the times with these things but in my defence think it probably wasn’t as big in Aus as the US?) and it’s great! 1. Despite the monsoonal rain we’ve had in Brisbane over the last week (basically it was like the air had turned into water at some points) I managed to sneak out into the garden for long enough to get some fallen branches tidied up and put in our green waste bin for collection tomorrow. 5. My niece is as beautiful as ever, and it is such a treat to watch her grow. I have also found that the it is immensely satisfying when one of the books I gave her becomes a favourite (due to wonderful sites like these with book ideas! Like today’s wonderful book). I also love to hear her read aloud (mostly in her own language) to herself. Thanks for that, Jules! I love Peter McCarty and look forward to reading both new books. His use of black space always blows me away. 1. The strange TV-in-the-bathroom-mirror at the Dallas Omni Hotel. 2. Seeing so many friends in Dallas. These are My People–the people who love books, know authors, and love to share what they know. 3. Hearing publishing people gush about their new books. A few of them walked me through new picture books page by page; their love for the project was inspiring. 4. Watching my second graders perform their puppet show. 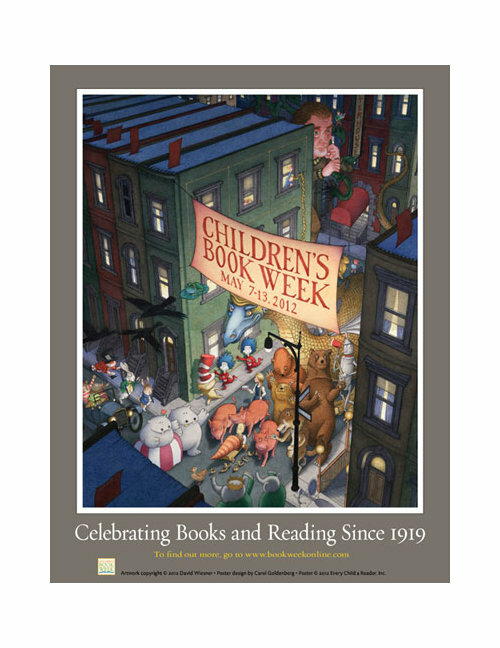 This year it was the MARVELOUS ZooZical by Judy Sierra and Marc Brown. 5. The lobby of the Adolphus Hotel. 6. That nice Cara at Minute Clinic who said, “Well, it’s strep. At least there is medicine for that!” Tea in bed with penicillin and Advil chaser. 7. Being IN the room when the Youth Media Awards were announced. I am still pinching myself. Peter McCarty’s art is a delight. Little Bunny on the Move is the first one of his books that I saw, & it’s still one of my favorites by him. One other cool children’s culture-related video I came across this week is Joel Plaskett and a yam puppet, singing, dancing, and dressing up. Plaskett is better known in Canada than he is in the States, which (on a completely non-children’s-culture-related note) inspires me to recommend his “Nowhere with You,” which is as fine a pop song as ever there was. Cheerful, too. Love the Aardman video! Hadn’t seen it before. But have Aardman ever done anything that was less than great? If they have, I’ve not seen it. Jules, I love your kicks today. All of them. Emmaco, wedding cake tasting, how yummy fun. Seeing friends on Friday and Saturday. We don’t get to see them much. Dinner with family last night. Seeing a bald eagle on my walk yesterday. Love Peter McCarty’s art. Jules, you mentioned the endpapers on The Monster Returns. 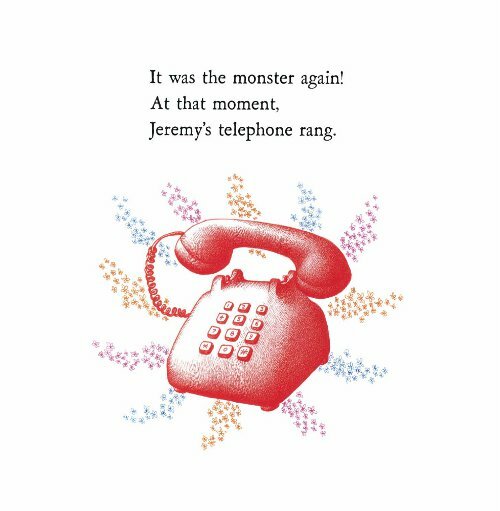 I saw McCarty speak a year or so ago and he talked about the endpapers on Jeremy Draws a Monster and said they were doodles from his sketchbook that he’d done trying to come up with the story. I imagine that’s the case again in this one. I wish you could have been at that talk–it was very process-y. You would have loved it. Most of Jules’ kicks were kicks for me, too, this week. I loved talking to the wider world about children’s books as they were getting so much attention. 1. On Friday night, I saw the documentary The Interrupters, which I can’t recommend highly enough. It is funny and deeply moving and has the power to change the way you think. 2. I’ve been watching Party Down this week on Netflix. It’s one of those ones I’ve been meaning to watch forever. It is hilarious but also makes points–just the kind of show I love. 3. We had Froggy from the books by Jonathan London visiting the library this week, and the programs were fun and really well-attended. 4. Yesterday when I was cleaning out my basement, I found a journal I was forced to keep at school when I was in the fifth grade. Talk about hilarious. I had no idea I had such a thing around, and I just laughed and laughed reading it. I remember being that kid. 5. Today there is some blue in the sky and every once in a while the sun is out. How I’ve missed the sun! Oh my, that monster in his pink hat looks all pimped-out, so damn funny! What great books, I remember loving it when you previewed the first one, can’t wait to grab a few copies of this one. Jules – love how happy all the awards made you. But I think you’d be really fun to watch the Superbowl with. What’s a football game/party without people getting all excited and yelling? Boring, that’s what! You are welcome to come watch football at my house anytime. Thanks for all the linkage, can’t wait to check everything out – but did watch Liz Lemon already, cuz I love her so very much! emmaco – wedding cake samples – yum! Adrienne – hooray for glimpses of sun, and thanks for the reccomendations, I will definitely try to check out The Interrupters. 1) Won a silly trial that would have had not-silly consequences for a client. But then, it’s generally a good sign when the police officer testifying for the state winks at me when he’s leaving the witness stand. 2) Came home Friday to Cole and Skittle napping together on the sofa. They acted embarrassed and moved before I could snap a pic! 3) Sunshine yesterday! Yard work with Cole helping. Plus walks. 4)A free iPhone app called Action Movie.Its very silly fun with special effects. 5) Attending a wine party at a fancy-schmancy law firm. Always fun to see the different side of things. 6) Soccer game last night. We lost, but played hard, and oh my what a workout! 7) The feel and smell of freshly laundered linens when you are soooo tired and ready to sleep. Emmaco, I was also late to 30 Rock but am now almost caught up (and I usually watch shows years after the rest of the country). … I’m still excited about your wedding. Do you know what kind of cake you want? I also loved reading about your niece. What are some of her favorite books? I hope she likes McCarty. My own daughters really love his books. …. Glad you all didn’t get swept off in all that rain. Wow. Robin, there was a t.v. in the bathroom mirror? So glad you had fun at the conference. Gotta go to one of those one of these days. Jone, happy birthday! And I agree with the lengthening-days kick. No doubt. Adrienne, ooooh. Thanks for the documentary recommendation. I’m in a serious Netflix rut. And I’ve never even *heard* of Party Down. .. So glad the sun is shining today for you (in more ways than one). Rachel, we passed each other in cyberspace. I LOVE THAT KICK about Cole and Skittle. HA. How quickly they acclimated to each other, huh? I’m so happy you have them now. Congrats on the trial. You go. And I snort-laughed at pimped-out, ’cause, yes, Monster does look pimped-out. Indeed. Sunshine and longer days seems to be a theme here. Here’s to sun for all…. Yes, it was an exciting week in the world of children’s literature. Thanks for this round-up, as well as your insightful reviews and previews of some stellar looking picture books. I loved, Henry in Love. I wasn’t as much in love with Colbert’s interview with Maurice Sendak – which seemed to be more about Colbert. I loved Jack Gantos on NPR though. My big literary kicks this week – finished Rachel Cohn and David Levithan’s YA novel, Naomi and Ely’s No Kiss List, and just started reading, Why We Broke Up – Daniel Handler’s new novel, with art by Maira Kalman. Brilliant. I’m tweeting this and linking it on my blog. McCarty Party is fun to say. Thanks, Jules. Hi, Peter. Congratulations on your new books! Yay for Hitchcock references! Congratulations to all of the authors and illustrators whose works were recognized. Oh, Stephen Colbert. You are delightful. Very fun to see and hear Colbert and Sendak. I now feel like saying, “The mouse should earn the cookie,” whenever someone wants something for nothing. Jules: I want to work with Tina Fey someday. emmaco: Kudos on your accomplishments at work! Sorry that the branch is gone, but the lovely plant underneath can now flourish. Glad that your niece is enjoying books. Robin: Congrats to your second graders! adrienne: Oh, what a treasure that journal must be! Rachel: Congrats on the win. Aw to the pets napping. 4) Music – I finally own David Cook’s album This Loud Morning and Erin McCarley’s Love, Save the Empty. Megan, I wanna read Why We Broke Up so super bad. Little Willow! Wow, Susan Lee is inspiring. I’m tired just reading about all she does. Break a leg tonight, and enjoy your music. My niece actually loves nearly every book, even those boring ones that just have collections of photos of objects with their names underneath. Long time favourites include Lynley Dodd’s Hairy Maclary books. Last time I visited she was loving this big board book Piggies. Books with animals are generally sure fire winners so perhaps Henry in Love can join her birthday book list, though she is still a bit enthusiastic with dragging books around so board books are still a good idea. I love watching her follow along and read to herself and to us, but I can bet it will be even more fun when we can move onto more complicated stories and delicate pages! Jone, in my foggy not-enough-coffee-yet haze I misread your name and didn’t recognize you! Happy late birthday! Sorry it was so darn rainy. Jules, that Morris Lessmore short is amazing! Little Willow – Thanks! And hope you smoked the competition last night!